That communal meal went on for three days. Every person used to have food at least twice a day. Some also used to have food three-four times a day because after the food, one Mohar (10gm gold) and one Dohar (expensive cotton shawl) was being given in donation. With this greed, they used to have food again and again. In three days, 18 lakh people by defecating and urinating would have collected heaps of rubbish all around Kashi. Kashi would have stunk. There were the residents of Kashi, the 18 lakh guests and one lakh attendants from Satlok. There would have been heaps of rubbish. It would have become difficult for the people to breathe, but nobody felt like that. Everybody was having food two-three times a day, but they were not defecating even once, nor were they passing urine. The food was so delicious that they were eating a bellyful. They were eating double the food than before. On the second day, all of them became worried that the stomach does not feel heavy, and we are feeling hungry as well; we might become ill. They disclosed their problem to the attendants who had come from Satlok. The attendants told them that – “This food has been prepared by adding such herbs that it gets absorbed in the body itself. We prepare this same food every day in our kitchen and eat this same food. We never defecate and neither do we urinate. Be assured”. Nonetheless, the people were thinking that we have consumed food, so at least some faeces should come out. They developed an urge to have a bowel movement. Everyone went outside the city. Finding a solitary place to defecate, as they crouched down, wind released from their back passage. Their stomach felt lighter, and fragrance came out of the wind as if Kewra water had been sprinkled. Seeing all this, everybody believed the statement of the attendants. Then their fear ended, but still everybody’s eyes were blindfolded by ignorance. They did not accept Supreme God Kabir Ji as Supreme God. There is also a topic in Purans that King Rishabh of Ayodhya renouncing his kingdom did sadhna in the jungles. His food used to come from heaven. His faeces used to emit fragrance. The people of the nearby places were astonished to see this. Likewise, by consuming Satlok’s food, only fragrance is emitted, not faeces. Heaven is a copy of Satlok and is fake. Question: - What is superior for doing bhakti – to renounce home for doing bhakti or doing bhakti while staying at home? Answer: - One will attain salvation by doing scripture-based worship after taking initiation from a Complete Guru and abiding by the code of conduct of bhakti throughout one’s life. If we will renounce home and go to the forest, then we will have to again come to the village or city at the door of a householder for food. To prevent ourselves from hot or cold weather and rain, we will have to build some hut. We will have to also beg for clothes. That again became a home. Therefore, stay at home. Do true worship; your salvation is certain. Whether one marries or not, both can attain salvation by doing bhakti. Many people say that bhakti can only be done in a celibate life. 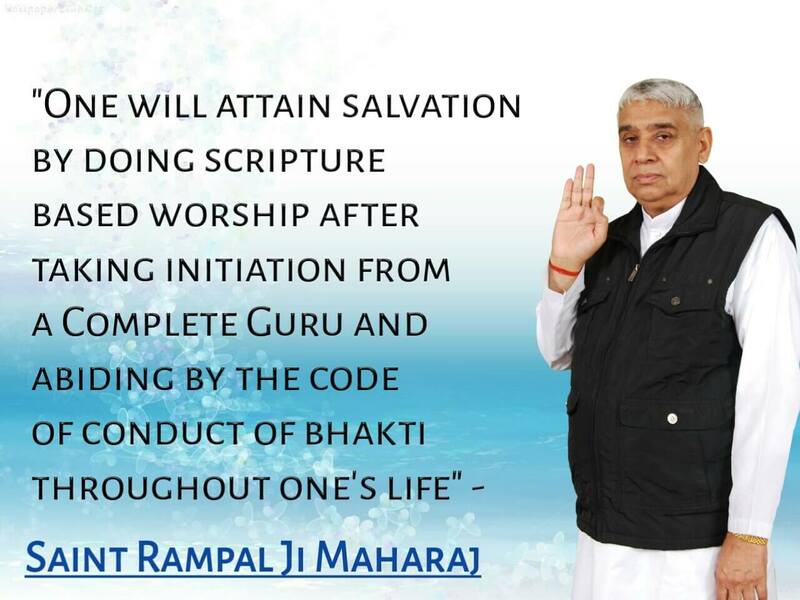 Its answer is that both can attain salvation by doing true worship according to the scriptures. Example: - We believe that Devotee Dhruv and Devotee Prahlad attained salvation. Both of them had married. They had children too. Prahlad’s son was Bailochan. His grandson was King Bali who had performed hundred yagyas. God acquiring the Bavana form had asked for three paces of land in donation from him. Those who say that only celibate people are eligible for salvation should ponder that eunuchs are forever celibate, so they must be even more eligible. Meaning: - The essence of speech no. 1 has been described above. Meaning of Speech no. 2-3: - Some people were saying that – ‘We went to mountains and jungles in the search of saints. In one place, a sage used to live in a jungle. The nearby villagers were saying about him that, that sage ties a loin-cloth of banana leaves on his private parts, and eats leaves-fruits-flowers in the jungle. He does not even come near the village. He does not even see the face of a human being. If he sees anyone, he runs speedily into the jungle. People were saying that whoever sees him becomes wealthy. For many days, to obtain a sight of him we went to the jungle in the morning and stayed till the evening. One day, we saw his back as he was running away. If we had obtained a sight of him, it would have been very lucky for us.’ Just think, such a person is a criminal who is masquerading to escape from the police. Sant Garibdas ji has given the title of a ‘Rojh’ (blue bull) to such a person, who being frightened from human beings, keeps running here and there. Even if such people wander day and night in the jungles, they cannot attain God. Read next in "Story of Harlal"